The society has seen many revolutions. Today we are witnessing what is called the Fourth Industrial Revolution which is essentially the proliferation of technology in all aspects of our lives. Businesses too have been revolutionised with technology to evolve from ‘manually driven’ to be ‘technology driven’ entities. Therefore the human factors in organisations have also changed. Organisations do not ‘tick’ the way they used to as the industry has changed. Q: What are the emerging challenges in Human Resource development and productivity which have manifested in the modern world, in the context of the Fourth Industrial Revolution? A:The Fourth Industrial Revolution is also known as the technological revolution where technology reigns supreme. Therefore we have reached an era where business is driven by leveraging technology to optimise output. Even when it comes to enhancing people productivity, there are different technology driven initiatives which are practiced in the world. Therefore the biggest challenge in enhancing human productivity and output in this Fourth Industrial Revolution is making people tech-savvy andinducing themto explore how to use technology to its optimum. This would not only enhance their own productivity, but the collective synergy of the organisation as well. Q: What are the key challenges experienced by the HR fraternity due to the above challenges, in terms of human capital development? A: As I explained earlier, it is all about being more technology driven. When you say being technology driven, it is about being more scientific. As HR professionals, especially when it comes to building people’s competencies and skills, we need to shift from the qualitative evaluations to more quantitative evaluations and measurements. Quantitative evaluations can only be perfected through analytics. Therefore, matrices and analytics have to be utilised in human resource development functions. We also need to ensure that other areas of organisationsare number driven. Therefore the challenge is to create a paradigm shift where you shift from being qualitative to quantitative and be analytics driven in decision making. Q: Is Sri Lanka ready to embrace new trends, how far behind are we? A:I believe Sri Lanka is ready to embrace these trends, especially if you look at the working population and dissect it into millennials and post millennials. I think millennials are future ready. Millennials are very much data driven, analytical and tech savvy. You can probably define them as the ‘Fourth Industrial Revolutionaries’.However, we also have the older generation, the decision makers and policy makers who are equally important. Decision making and adopting to change would be the biggest challenge that Sri Lanka would have in terms of pre-millennial population. However I do believe that the future or the new generation of this country is ready. Q: As a country what are the opportunities we should look to seize in order to stay on par with regional and global competition? A:I strongly hold the view that we should have strategies that should stop the brain drain. We need to get people who have migrated to foreign countries back into our system. We need to have effective policies in the country so that people are attracted to come back.We need to make Sri Lanka a knowledge hub. SriLankans are very smart. We have a very educated and highly intellectual set of people but it is scattered across the world. They are creating wealthand adding value for other societies and countries. I think what we should do is to bring them back whilst drawing effective strategies to retain the people who are here. We need to retain those who have not taken the option of moving and try to use themfor nation building. For instance, a majority of the Silicon Valley work is being done offshore in places like India. Business process as well as consultancy services are often outsourced. These are areas which we can invest our talent in because from regional perspective we are as good as any of our regional neighbours. We are better in terms of literacy rate and the depth of education. Q: What are the areas in human capital development which we need to focus in order to build organisations to last? A:Equipping people with necessary skills and affording opportunities for people to use these skills and empowering them lavishly. Further appraising people better and rewarding people objectively becomes a critical need. We see, a divide between what is desired and what is seen in critical talent building and rewarding output in this country. Most importantly we need to build mindsets of people to understand that change is the only constant. Change is inevitable. Not only you need to manage the change, you need to lead the change as well. What happens in many organisations is that when you go through phases maybe from a small family owned company to a conglomerate or from a government entity to a private entity or a public shareholding entity, there are fundamental realities that come in as change. The biggest hindrance that impedes progress is that our people are not ready for change. Managing change has to be the mindset we need to build. When you say manage change, you have to drive change as well. If you look at the human resource function of an organisation, it is vested to a very large extent on leading the change by various interventions and engagements. I think that’s one of the main areas we need to be involved in as HR professionals. Q: As a leading HR figure in the country what is the strategic shift that HR fraternity should embrace in order to progress with the modern trends? A:We need to be the leading force of the business. HR was once considered as a supporting role. Thereafter HR was known as a business partner, then a business driver. Another fine-tunedterm would be to define HR as a leader who leads the business because it is people who drives change. It’s not buildings or machines or technology that drives change. You can develop, shape and mentor your people to win wars and win revolutions,achieve business success or even be destructive. Therefore it all depends on how you engage with the employees. The biggest challenge is to ensure that HR fraternity understands that they are there to lead the business. 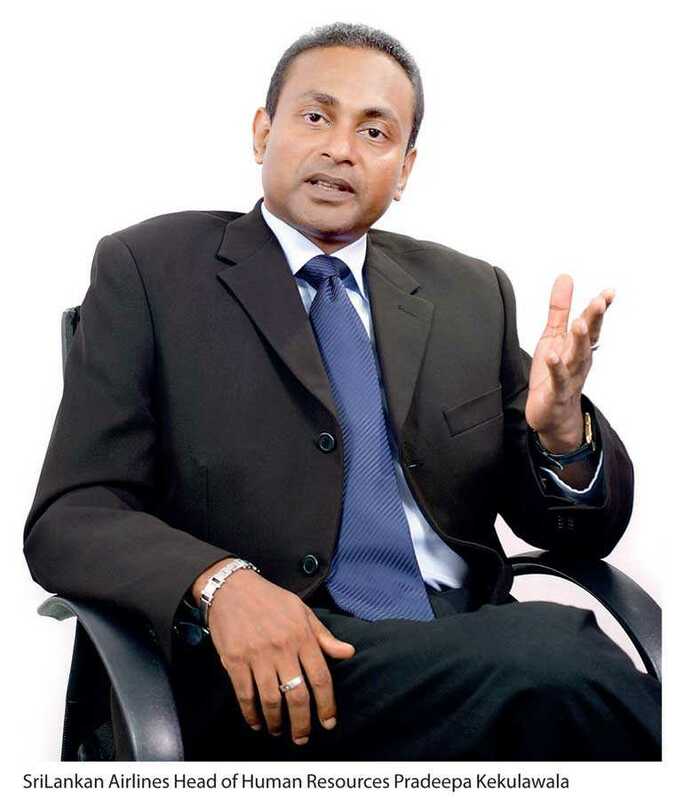 Q: As the Head of Human Resources of SriLankan Airlines what are the people factors or practices that the organisation should embrace to confront the challenges and restructuringthat we are hearing about? A:The biggest challenge would be to accept the need to change and make people become the drivers and leaders of change. SriLankan Airlines which was once a legacy carrier is now forced to look at itself as a value carrier or a competitive carrier who has to take on the so called giants of the industry. SriLankan is now forced to come out of the shell of the comforts of a 30 year history and look at novelties and new practices without resting on its laurels. Glorious 30 years has no meaning if we don’t look to the future. SriLankanAirlines is also forced to look at options to shrink with a view to grow and this Government has clearly spelled that SriLankan will have to think that it has to create value and be self-sustainable instead of being spoon-fed by the stakeholder. In simple terms SriLankan is forced to change its business model. Change of the business model callsfor change in thinking. Change in thinking comes down from stakeholder to the last level of the organisation. How you adapt yourself to the change is the challenge. You either change or perish.